Yarmouth is a predominantly residential community with a beach flare (cottage colonies, summer rentals) on the Nantucket Sound side. It is made up of 3 charming villages including West Yarmouth, South Yarmouth and Yarmouth Port each with their own unique characteristics. Yarmouth has many historic homes, great beaches, restaurants and family-friendly entertainment. For additional information or any question about Yarmouth, please feel free to contact us. Bass Hole offers multifaceted recreational opportunities and is located in the extreme northeastern corner of Yarmouth. It features swimming, kayaking, fishing, bird watching, picnicking, and lovely views--something for everyone. It overlooks Chase Garden Creek and marshes, has a picnic pavilion, and boardwalk into Cape Cod Bay. 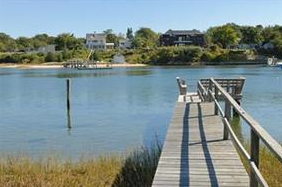 At low tide the Creek can be crossed to Chapin Beach in Dennis. Englewood Beach on Lewis Bay offers a town sailing program and has a public boat launch and marina. It is especially appealing with its restroom facilities and protected beaches-- a great place to spend the day watching boating activities. Yarmouth has all sorts of recreational activities including trails, boardwalks, fishing, boating, golfing, claming, quahoging, canoeing, shell fishing, biking and walking. Water related recreational activities are centered on Bass River, Lewis Bay, and Parkers River including marinas, beaches, and moorings all along the Bass River. The Cape Cod Cultural Center, near the Bass River, features art exhibits, a wide variety of musical performances, and a farmer‘s market in the summer. Numerous charming Bed and Breakfast establishments can be found in the Old King’s Highway Historic District and in the Bass River neighborhood along Old Main Street.